There is nothing nicer for the keen gardener than propagating new plants from old ones. Plants don't go on forever and they can soon tire and look past their best. Personally I like to let most of my plants go to the great 'compost heap in the sky' after a season, two at the most, and replace them with fine new healthy youngsters. Many people I've spoken to seem to look puzzled or sceptical when I speak of continually renewing my plants by taking cuttings but nothing could be simpler. I confess that my first attempts were undertaken with much scepticism and a good degree of failure, but gradually my success rate improved from 5 out of 10 cuttings growing successfully to something better than 9 out of 10. What is also pleasing is that the same technique works equally well for many other plants. Most text books will describe the "cutting in soil" technique that I use here, but placing the cutting in water in a small glass or container works equally well. The preparation of the cutting is the same whichever method you use. No doubt there are plenty of technical terms and explanations I should be giving you but the fact is I am not an expert, am not technically competent and I don't really know much about plants or gardening in general. All I do know is that this technique almost always works for me, and I'm happy to share it. First of all find yourself a nice plant from which to take your cutting. A diseased or unhealthy plant is not going to stand much chance of creating anything other than a diseased or unhealthy cutting. Examine the plant and look for a stem that has a growing tip, below which there are at least two pairs of leaves. The photograph on the left (Fig 1) shows a perfect example. What we need to do is remove the stem just above that third pair of leaves which will ideally be 2 to 3 inches in length. 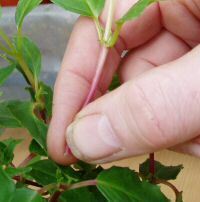 I know some gardeners who use secateurs or sharp knives but, to be honest, Fuchsia stems suitable for making cuttings are so soft and tender that it is easy enough to pinch through the stem with your thumb nail (Fig 2). As a point of interest, a brand new pair of leaves will develop on the mother plant where the cutting was taken from. This means that in a relatively short time there will be two stems where there had previously only been one. 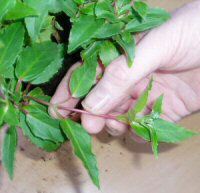 Frequent 'pinching out' of stems in this way is a proven method of making your plants more compact and more bushy. Obviously the more bushy the plant the more flowers it will produce, so pinching out is good practice even if cuttings are not needed. 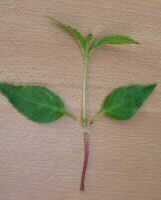 Some cultivars of Fuchsia have leaves that form in three's rather than pairs. These benefit even more from the effects of pinching out growing tips. (Please see my Fuchsia care tips). Now, with the cutting on the bench it is necessary to remove the surplus leaves and stem and expose the growing region. Plants major growth areas are in their leaf nodes. This is the 'knobbly' part where the leaves join onto the stem that I am pointing my knife blade at in Fig 3. Now is NOT a time for bravely hacking away with your thumb nail. Rough and jagged cuts will encourage germs and disease. Take a sharp knife and carefully remove the lowest pair of leaves and the length of stem below the leaf node. Fig 4 shows the dissected cutting. There seems to be mixed opinion on the value of using rooting hormone compounds. I normally use a hormone powder, but I have been through periods of not using it and can't honestly say I've noticed much difference. I am of the opinion that if you have chosen a nice cutting and prepared it correctly, then it will manage the rest all by itself. Assuming you have some, dip the end of the cutting in the compound and dibble it into a small pot (Fig 5) of ... get ready for it ... 'Potting Compost'. In my photographs I have mixed potting compost with vermiculite which aids drainage and aeration of the soil. Again, I don't always use it and again I have noticed little difference. If I have a single cutting to deal with as in this case then I use a very small 2�" pot. Three or four cuttings can be placed in a single 3" pot. If I am taking a number of cuttings then the plastic modular trays that you can buy cheaply from most garden stores are ideal. So there you have it. One new tender Fuchsia (Fig 6) already to start growing and reward you with a wonderful display of beautiful flowers. All that remains to be done is to water our new 'baby' and put in a label. Place your new cutting on a window sill or in a greenhouse if you have one. I know it is recommended to place a plastic bag over the cutting to keep its microclimate moist and humid but again this is not something I ever bother with. Of course, as I mentioned at the beginning, you can simply stand the cutting in plain water, which some people find much easier. In this case, just wait until you can see some well-established roots and then put it in a pot with soil and water it well. Cuttings can be taken at any time of year except winter but the earlier in the year it is, the more successful will be the result. Spring is the perfect time. It is a time when the plants are abundant with fresh new growth and when you should be 'pinching out' the growing tips anyway to stimulate a more bushy habit. It also affords each plant the whole summer season to grow and establish before the next winters hibernation. Summer cuttings aren't quite so vigorous and result in slightly less developed plants by the winter but, nevertheless, summer cuttings are very successful and can form part of your regular garden maintenance routine. Autumn cuttings work but the plants are now lacking in energy and are past their best. There is little time for the new plants to establish before the cold months of winter. That said, trimming back plants in readiness for the winter provides a wealth of free cutting material and it's a shame not to make good use of it. (see my guide to over-wintering). I have a small hotbed in my greenhouse for early spring seeds and this provides an opportunity to get some extra use out of it.